The latest robotic offering from Boston Dynamics is quick, agile and looks like it may just keep you awake at night, as well as potentially putting many factory workers out of a job. 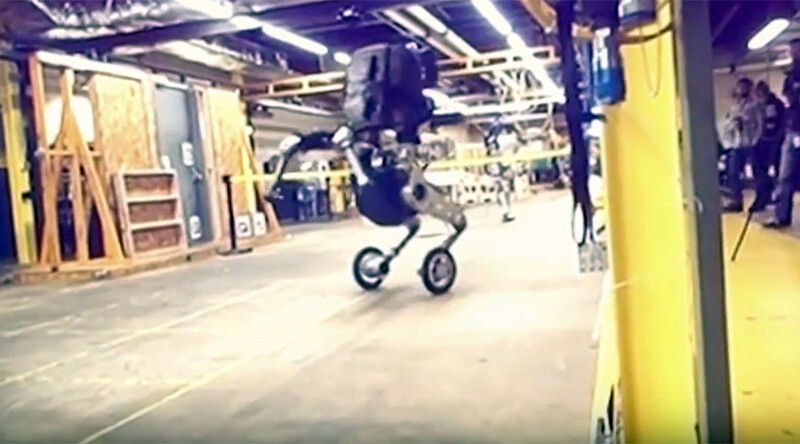 Video footage leaked online shows Boston Dynamics’ founder Marc Raibert detailing their latest robot, Handle, in a presentation to potential investors. So-called for its ability to carefully handle objects, the latest iteration from the Google owned company can be seen riding around upright on two wheels, spinning on its axis and leaping over obstacles and landing perfectly. Handle breaks the mold for the Google owned firm, whose robots usually operate on two or four legs. While the addition of wheels adds speed, it does so at the expense of being unable to traverse uneven surfaces. It seems, however, that such a machine, if ever created beyond prototype phase, could be used to transport goods within a factory or warehouse, Raibert explained.